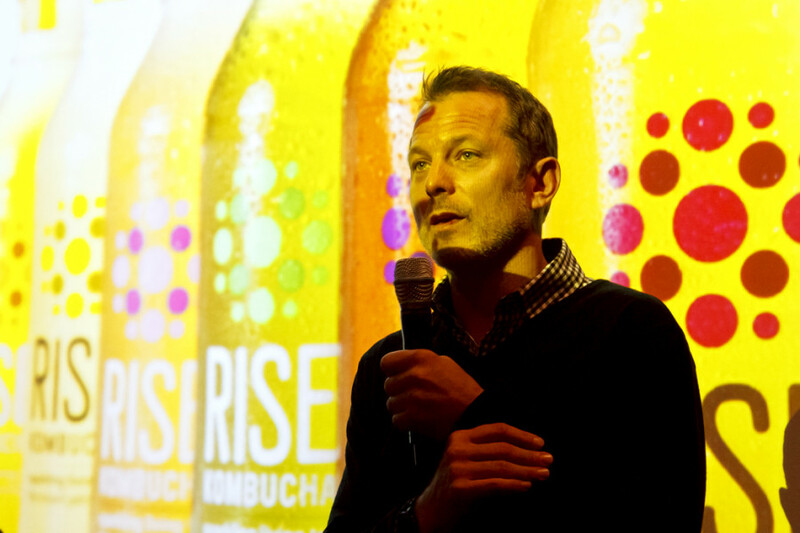 Hope for social and environmental change is in the hands of small private sector businesses, according to one of Rise Kombucha’s founders. Giacomelli was the first of three speakers at the Sustainable Business Night organized by the John Molson School of Business Sustainable Business Group Wednesday evening in the Floating Room at MB 2.130. He helped found the Crudessence restaurants in Montreal and Rise Kombucha—a fermented health drink—and says he’s onto starting a B corporation, a type of business that supports positive change. He told the group that to survive in the future, businesses would have to collaborate and work on a platform that “benefits everyone,” rather than compete. Business should be modeled after nature, Giacomelli said. Meanwhile, it’s difficult for banks and other big businesses to stray from investments that are harmful for the environment, Rosalie Vendette, a senior advisor at Desjardins, told the room a little later. Vendette manages “socially responsible investments”—investments into companies that are finding ways to give back. Desjardins has certain standards big corporations including Big Oil have to adhere to, like a “checklist,” Vendette told The Link, to be a part of the folder. The downside, Vendette conceded, is bankers haven’t yet found a way to not follow stock market proportions. They invest in the same industries, at the same proportion as everyone else. One of the first came from VP External Relations of JMSB’s Sustainable Business Group Pierre Sieur, who wondered why the natural gas sector continues to be invested in. Vendette explained stock market regulation prevents even socially responsible investments. “I just think that instead of saying, ‘Yes, I’ll give you the money, but you’re going to have to change,’ stop giving them the money,” Sieur said. In speaking with The Link after the talk, Sieur said he understood where Vendette was coming from, but added, “I just feel that there are things that they can further do to help invest sustainably by promoting it more than they do now. Vendette later reiterated the limitations set out by the stock market to The Link, but further explained the standards to which Desjardins holds the companies it invests in. She said there are seven standards for the credit union. The first is to “eliminate the worst,” Vendette says. “The first thing we do is we exclude nuclear, weapons and tobacco. So, those are three sectors that we don’t tolerate,” she told The Link. She also added that the company has been in conversations with the company about “security issues” with its proposed pipeline. “In fact, [we’ve been] in a continuous dialogue since 2009 approximately,” she said of Desjardins raising the issues to Enbridge’s board of directors. Wayne Burke and Steve Shoiry, the cofounders of DNE Resources, an energy consulting firm, also took the floor. The firm is looking for ways to keep a small-company feel among their employees as their business expands. They echoed Giacomelli’s statements, saying they worked on holding their clients accountable in their mission to be more sustainable. After the speeches, the crowd of about 50 drifted to the third floor for cocktails. Back at Desjardins, Vendette says her team dedicated to “socially responsible investments” is “trying to create products that would be investing less in fossil fuels,” but the stock market is a difficult place to effect change.